There are a number of rules that govern the movement of trains in the yards and on the mainline. The broadest and most basic set of these is the Standard Operating Procedure (SOP) manual, which lists the standard operating procedure for pretty much every situation that can happen in normal and emergency circumstances (such as what you need to do if your pre-empt times out and you don’t have a secondary call loop or push button). Then there’s the rail operator rule book, which covers the most pertinent information from the SOP manual that an operator will need on a day-to-day basis. For anything that will deviate from the normal rules and SOPs without being a permanent change to them, a train order or special instruction will be issued. Train orders and special instructions are temporary rules issued by Control that will govern train movement under special circumstances. A train order will last for a maximum of 24 hours, and a special instruction will last for a maximum of one year. Operators are responsible for getting the day’s train orders at the beginning of each work shift, verifying that they are understood, and following them while they are in effect. A train order will often have a restriction on normal operating procedures, such as requiring operators to reduce speed below the posted speed limit in an area or to call Control for permission before selecting at a platform. One common example of a situation that will have an associated train order is the presence of workers in the right of way. This could be for signal or switch maintenance, a walking inspection of the track and overhead wires, litter patrol, etc. 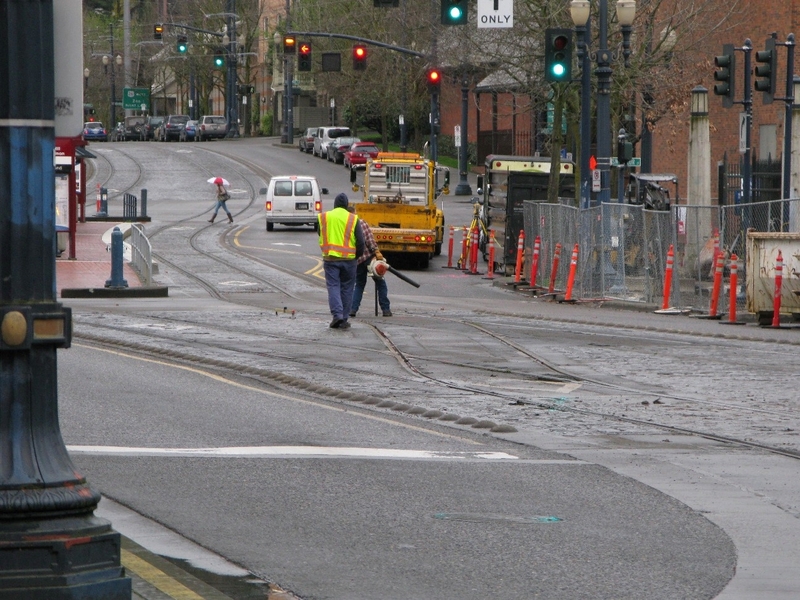 Workers in the right of way (top) are protected by a call board at PGE Park (bottom), which is governed by a train order. Here the call board is used because of limited visibility around the corner from this platform. Train orders can also include customer service information – for example, a train order can require operators to make announcements to passengers about any unusual circumstances that may affect their travel related to the train order (like when there’s a major interruption to service). In addition to written train orders that generally are related to planned events, verbal train orders will be given when an unplanned situation arises that requires something different from standard procedures. For example, if a crossing gate fails, a verbal train order will be issued for operators to stop and call Control from the platform before the failed gate. Last weekend’s Galleria action was a recent example of an unplanned situation with a verbal train order: because of police activity on the platform, operators were instructed to proceed at walking speed from Park Ave, stop at Galleria without opening doors to call their signal, and then continue west. When a verbal train order is given, operators will repeat the train order back to Control word for word to ensure that they understand what is required. A verbal train order always takes precedence over any written train orders, rules or standard operating procedures. Train orders are best for short-term changes to normal operating procedures that won’t last more than 24 hours. If the changes will need to last longer than 24 hours, a special instruction will be used. Because a special instruction can last for a year, these will be issued for ongoing situations such as construction on part of the mainline. If the operating rules around a situation like that are not likely to change within the year, it makes more sense to issue one special instruction rather than a new train order for every day that it’s in effect. A special instruction takes precedence over written rules or SOPs, but a train order will take precedence over a special instruction. In addition to the above rules, relevant information is distributed to operators in several ways. Sometimes this is done verbally over the air where a Controller will give information for all trains affected by something (for example, a substation going offline which will affect how operators leave platforms.) Other information is distributed in written format, via maintenance advisories, Trainlines, and other postings. A maintenance advisory is an overview of what’s going on on the alignment for that particular day, and it gives operators information about circumstances that will involve people on or near the ROW or events that will result in unusually crowded platforms. A maintenance advisory will include things like city construction work that doesn’t directly involve the trains but may be occurring near the alignment, such as the painting of road lines or bike boxes. It also lets operators know if any non-TriMet people have track access permits (e.g. when video crews film on part of the alignment), if any training will be taking place on or along the alignment (e.g. new rail operator, new supervisor, or new Controller training), or any public events (e.g. Blazer games) that will result in a heavier than normal passenger load. 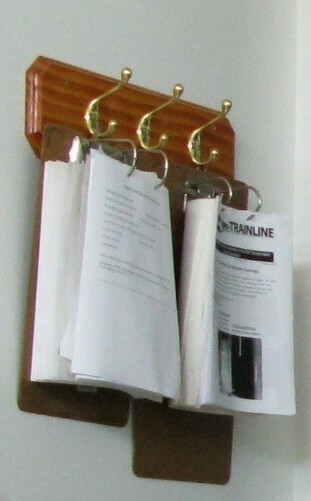 Trainlines are one-page newsletter-type postings put out periodically by the rail training department. 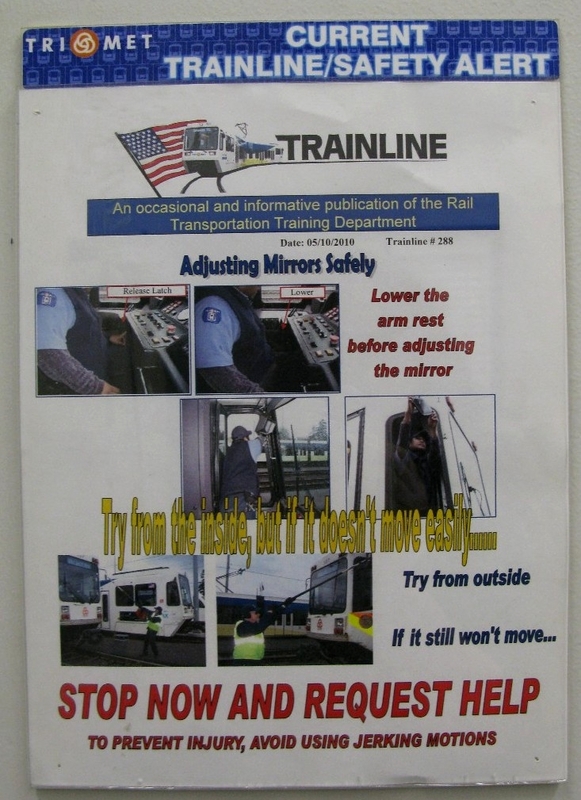 Topics covered by Trainlines vary – many are about best practices for a variety of operational matters such as adjusting mirrors on the trains (shown above) or keying in, reminders of safe operation when leaves are falling, reminders of rules or speed limits along the alignment, or sometimes just common courtesy. Operators are responsible for strictly following all SOPs, rules, special instructions, and train orders, and information on all of these is always readily available because of how important it is that everyone clearly understands them. I know as part of this recent focus on safety, people have suggested that safety information should be posted in operator break areas, but that has already been going on long before the recent safety efforts. 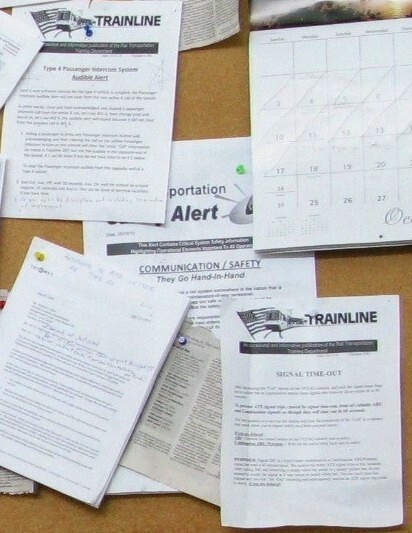 The pictures below are from the break room at Expo (just as an example) where copies of special instructions, Trainlines, and other safety communications are regularly posted. 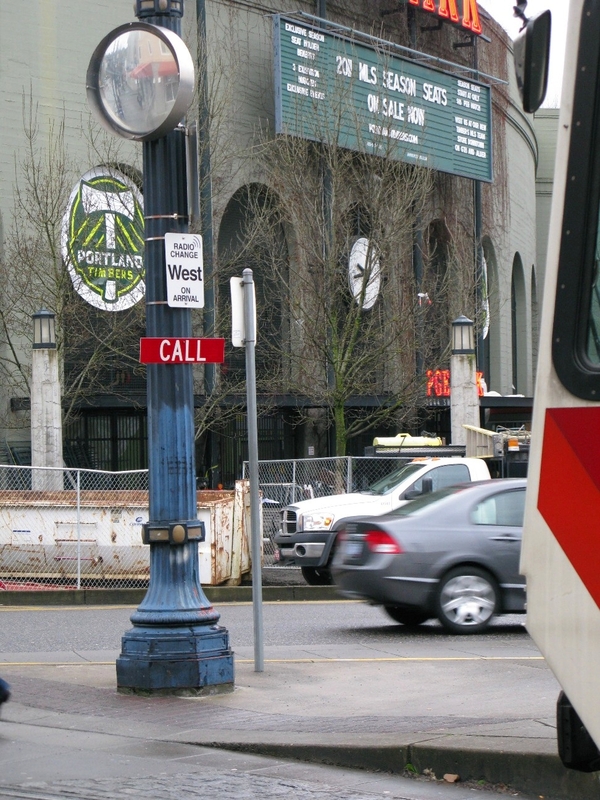 This entry was posted in alignment, safety and tagged control, light rail, max train, portland, public transit, public transportation, rail, railroad, safety, trains, trimet. Bookmark the permalink. I’m curious, what sorts of train orders are being put in place for the Rose Parade?